The original incident, in which a nursing mother, her 22-month-old daughter, and her husband were kicked off a flight for refusing the attendant’s directive to “cover up,” took place on October 13. Interestingly, it doesn’t seem to have made it into the news until this “nurse-in” protest was planned. Thanksgiving week! Cross-country airline travel with a toddler! My much-tried mother bedridden with the stomach flu! I have to leave in 20 minutes and I only just got packed! I may be posting while I’m away, but then again, I may not. Have a glorious Thanksgiving and hug somebody you’re thankful for. And thank you for reading this blog. All of this has riled MGM, which in recent weeks has been openly touting the fact that the newly revamped studio is serious about making “The Hobbit” — with Jackson. It’s one thing to shoot yourself in the foot with your fan base, but quite another to tick off a studio that may have more clout than you — if not in this particular matter then quite possibly in Hollywood at large. TheOneRing.net also reports that even if Peter Jackson does not direct, his special effects company, WETA, would not be barred from doing the films. Interesting, that. … to Mr. and Mrs. SeeDubya, Baby SeeDub #1 and the new and shiny Baby SeeDub #2. PSA to new moms in hospital: bend the nurses to your will. Your baby, your rules. Manager Ken Kamins got a call from the co-president of New Line Cinema, Michael Lynne, who in essence told Ken that the way to settle the lawsuit was to get a commitment from us to make the Hobbit, because “that’s how these things are done”. Michael Lynne said we would stand to make much more money if we tied the lawsuit and the movie deal together and this may well be true, but it’s still the worst reason in the world to agree to make a film. However last week, Mark Ordesky called Ken and told him that New Line would no longer be requiring our services on the Hobbit and the LOTR ‘prequel’. This was a courtesy call to let us know that the studio was now actively looking to hire another filmmaker for both projects. Ordesky said that New Line has a limited time option on the film rights they have obtained from Saul Zaentz (this has never been conveyed to us before), and because we won’t discuss making the movies until the lawsuit is resolved, the studio is going to have to hire another director. On the face of it that’s sound business policy; would you want to work again with somebody who successfully sued you? But as a practical matter they will have to weigh their right to conduct their own business against how much business they’d be likely to lose if somebody other than Jackson’s team makes these films. And on that I can’t begin to speculate beyond saying that while the community that loves Peter and only Peter is large and vocal, they by no means comprise the millions of filmgoers worldwide who would make up the bulk of the business. Me? I might see them made by somebody else, but there’d have to be really good buzz coming off them first. And if you don’t get that buzz from the diehards (like me), then where’s it going to come from? New Line should tread somewhat carefully, I think. Sarah Ferguson on Dancing with the Stars? Works for me, but Emmitt is a tough act to follow. I watch Grey’s Anatomy, and I don’t apologize for it [she said defiantly]. True, almost every other character is more interesting than Meredith Grey, although I keep thinking she should have some potential in there. But anyway. Thursday’s show included a child whose nanny backed over her with an SUV because her mother sent the nanny to the store and then didn’t keep the child corralled in the house while the nanny left. Nanny gets fired, but child, in her injured, drug-sleepy state demands nanny’s return relentlessly, despite her mother’s constant presence: “Where’s Anna? I want Anna. Where’s Anna?” Nanny eventually returns. Well, pray tell: who is? Man or woman, who could possibly be better at stay-at-home parenting than at a job that affords you a level of control not available to moms and dads? I suspect it’s only a lucky few who feel they are better at parenting than at the job they loved and left behind to stay at home. Not a week goes by when I don’t think, perhaps not in so many words, how much better I am at editing–and how much easier editing is!–than at stay-at-home mommying. And why wouldn’t I? When I cross out a word with my red pen, it stays crossed, by gum. Whereas just because I tell my son something doesn’t mean it happens. But don’t confuse “I was better at [X]” with “I’m a bad mother” and allow it to overly influence your judgment. The two scales–how good you were at your job vs. how good a mother you are–cannot be directly stacked and compared. I chose to stay at home with my son because I felt his mother’s presence would be better for him and for me than the alternatives. All stay-at-homes have our frustrating days, but let’s do ourselves this favor: remember that worse is better. Worse than you were at your other job is still better for your kid, if you’ve made that choice. Please don’t misunderstand: I have nothing negative to say about moms who work outside the home; it’s a choice each family makes in their own situation. But if you’ve made a considered decision to stay home, give yourself a break for not being as great at it as you were at going to the office. It’s a totally different scale, and fortunately, our kids judge on a yet another scale than we would. If your kid understands how loved he/she is, then you’re doing much better than at your old job. Go with it. Today The Little Bean and I went “overtown,” as Bevery Cleary describes crossing the Willamette River to enter the other side of Portland, on an errand to the airport. 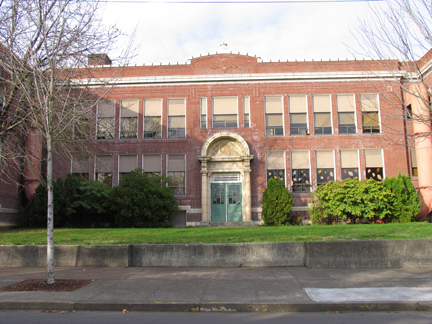 On the way we scouted several locations in northeast Portland where Beverly Cleary passed her childhood. 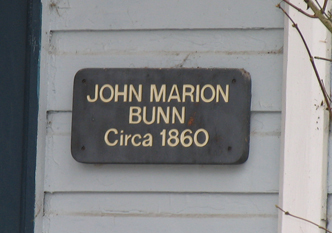 She lived until she was five or so at the farmhouse pictured in my previous post; her paternal grandfather is the “John Marion Bunn” in the plaque on the wall of the house. Her family subsequently moved into town. During their sojourn in the first of two rented houses, little Beverly Bunn attended Fernwood Grammar School, now Fernwood Middle School. 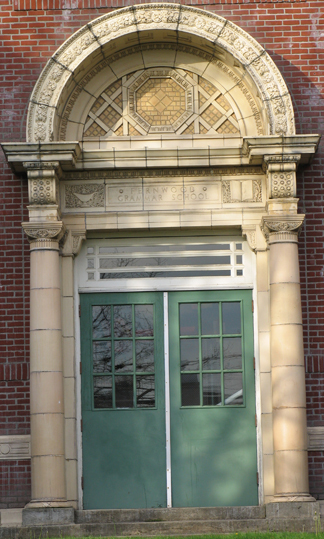 This clearly used to be the front of the school, but judging by the lack of handles on the door surrounded by neat stonework, it’s no longer even an entrance. 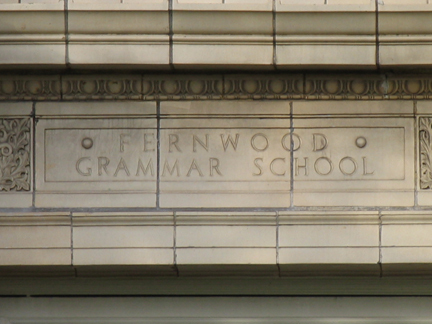 The inscription over the non-entrance reads “Fernwood Grammar School.” Around the side, on a newer portion of the building where the main entrance now is, is a newer sign designating it Fernwood Middle School. Pictures of Cleary’s high school and the home her parents bought when they sold the farm after the jump. Kate has asked me to come on board at Electric Venom, and I’m honored to do so. Look for some cross-posts as well as different posts both here and there. Thanks, Kate! I have been a wee little bit too invested in Dancing with the Stars the last couple of weeks, as it came down to the wire between Mario Lopez and Emmitt Smith. For a long time I was okay with both, thinking “Mario’s the better technical dancer, so that’s fine, he deserves it …” but in my little fangirl heart, Emmitt had it locked up. His earnestness in devoting himself to an unfamiliar discipline, his running back’s grace and footwork, his gorgeous smile, and his laid-back charm, dubbed “The Big Easy” by the judges, totally won me over. Mario is good, but everybody loves the underdog–Mario had a dance background and a little too much defiance in the early going. But what really tore Mario’s chances with me was his mimicking of Michael Jackson a few too many times. Dude, I know you grew up in that era; I did too, but please understand, Michael Jackson is done, forked, and totally disgusting, and idolizing him doesn’t win you points with any sensible fan. But back to Emmitt. As good or better than watching him become an accomplished dancer, for me, was finding out a little bit about the person he is. I’ve grown to expect so little out of sports figures, and knew so little about Smith going into this show, that it was really nice to see that the career rushing champion is a genuinely good guy, a hard worker, and yes, a good role model. And major kudos to his partner, professional dancer Cheryle Burke, for making the most of his strengths and showing them off. Nice work. And good show. A forthcoming book, Who Really Cares by Arthur C. Brooks of Syracuse University, purports to demonstrate that “compassionate conservatism” is more than just a clever name when it comes to the private giving and volunteering of conservative citizens as opposed to their liberal counterparts. Yes, really. Like fantasy football, except that they apparently don’t lose points for letting the opposition roll them. And like real Congress, except that if you don’t like how your MC is performing, you can swap him/her out over the weekend for somebody you think will do a better job. If introducing/passing legislation were the only rating needed to measure an MC’s capability, this page would be invaluable to voters. Real ones. 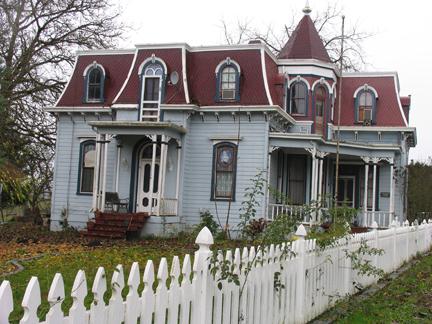 Yamhill, Oregon, is a very little town an hour or so out of Portland and the first home of children’s author Beverly Cleary. I read and enjoyed a good many of her books when I was younger, and I’ve just finished both parts of Cleary’s memoirs. Today I thought I’d drive out into the valley, along the eastern edge of the Coast Range foothills, down to Yamhill to see if her childhood home is still standing. It is. Front view of the house “with the green mansard roof,” no longer green. While the house looks charming for its age, the view west to the Coast Range is obstructed by farm buildings set in a patch of mud, while the front yard is closely pressed to the east by other houses and some run-down cars and trucks. The home still appears to be attached to some acreage, as it was in Cleary’s day, judging by the open fields beyond the muddy farmyard. I was pleased to find it still there, a bright spot in the rainy Oregon fall/winter that I’m already tired of. Later in the week I’ll scout for a few other Cleary locations around town.